Number Maze is a game that combines mathematical problems with maze-solving skills to make the rote learning of addition, subtraction, multiplication and division more fun. Number Maze's difficulty can be adjusted to make it an easy game for a young child, but it can be made difficult enough so that an adult can become lost in the maze. THE GOAL OF THE GAME IS TO FIND THE PATH FROM THE HIGHLIGHTED NUMBER IN THE TOP ROW TO THE HIGHLIGHTED NUMBER IN A BOTTOM ROW. Number Maze was written using TDI's Modula-2 programming language. You will require that software package to type the game from the supplied listings. If you don't have Modula-2, you may acquire the program by purchasing this month's disk version or by downloading it from the ST user's group on DELPHI. Listing 1 is the Modula-2 source code for Number Maze. It should be typed in and compiled according to the instructions that came with your Modula-2 compiler. Listing 2 is an ST BASIC program that will create Number Maze's resource file. You must have the resource file in the same directory as the main program if the game is to run properly. Load ST BASIC, type in Listing 2, and then save it to disk. Now use ST-Check found elsewhere in this issue to check your typing for errors. Once you have an error-free version of Listing 2, run it from ST BASIC and Number Maze's resource file, NUMBER.RSC, will be written to your disk. The goal of the game is to find the path from the highlighted number in the top row to the highlighted number in a bottom row. The maze is made up of ten rows with ten columns of numbers. These numbers are calculated such that the solution to a particular problem will form a pathway through the maze. 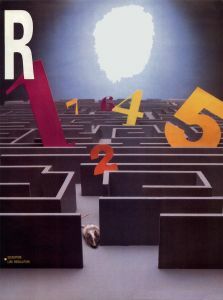 To move around in the maze, you must solve problems using certain mathematical operations on specially selected numbers. In the lower right corner there are the numbers that will be used for the problems with plus and minus signs next to them, as well as multiplication and division signs. These numbers are used with the proper operation to find the path. From each number you can move to another number by performing the proper operation. You keep doing this until you finally reach the bottom highlighted number. This may sound complicated but it is not. Let's say that the flashing number is 25 and the "plus" numbers are 3 and 7. Then if there is a 28 or 32 either up and down or left and right. You can point to it with the mouse and press the left button. You will hear a beep, and the chosen number will flash. The number and operation that is used to move to the next square may be picked randomly by the computer at the beginning of the game or you may wish to set the game's options yourself. Since this is an educational game, it is set up to allow different levels of difficulty. There are two standard games. The first game uses only addition and subtraction for the operations, while the second uses multiplication and division operations as well. These games have a condition called "backwards." If you move to a number by adding two to it, then you can reverse back to that number by subtracting two from it. The same thing is true when you use multiplication and division. Being allowed to move backwards makes the solving of the maze easier, because if you make a mistake, you can move back and try again. 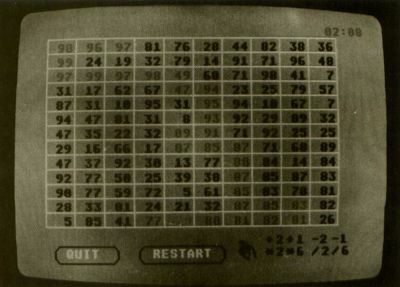 In the standard games, the computer will randomly pick the numbers you have to use to move through the maze. If you do not wish to play a standard game, you can choose how the game will be set up. All of the choices are made using dialog boxes. The choices allow you to include multiplication and division operations. You can also choose the number to use in the operations, as well as whether to allow backwards movement or not. To move between lines of a dialog box, use the tab or the up and down arrow keys. When you have typed in your choices, click the OK button. Once all the game options are set, the game will begin. Sol Guber is a chemical engineer who fell in love with computing in school. He has been programming for more years than we can remember, and as a result, he is the proud father of a computer-literate daughter, Rebecca. When the game starts, there will be a flashing number on the screen. This number is the base and another number—either to the side, or above or below—is the proper move. Move the cursor to your choice and click the left mouse button. If your choice was correct, you'll hear a beep. If not, you'll hear a "burp," and you'll have to choose again. There is no scoring in this game. In the upper-right corner there is a clock that shows you how long you have been playing. On the bottom of the screen there are two buttons that can be clicked. The RESTART button will restart the clock and give you the same maze again. The QUIT button will allow you to quit the game. After you click on the QUIT box, a dialog box will ask you if you wish to see the maze's solution. You can also choose to play another game. If you reach of the end of the maze, the screen will sparkle for several seconds. Number Maze teaches mathematics in a fun, risk-free environment. It is a non-competitive game for the whole family since its difficulty can be adjusted. It combines maze-solving skills with fast arithmetic skills to act as a drill that is lots of fun.